Hyalobarrier is a medical device by the biggest producer of hyaluronic products in the world Anika Therapeutics designed for the prevention of post-surgical adhesions, especially in obstetric – laparoscopic or open surgery. Hyalobarrier is applied in surgery for endometriosis, myoma, ovary and fallopian tube operations, Asherman’s syndrome, post-Caesarean section etc. 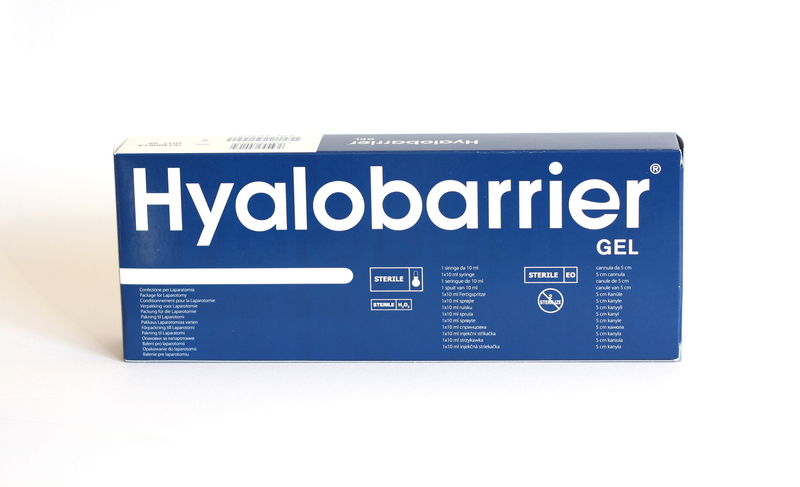 Hyalobarrier is a sterile, transparent, highly viscose gel based on hyaluronic acid, which physically separates tissues. Hyalobarrier remains in the area of application for 7 days, protecting the organism during the 3-5 days of adhesion risk and completely degrades up to 30 days (bioabsorbable). Hyalobarrier is produced through biofermentation; it is not of animal origin, but a completely natural product, because of which it is applied in Caesarean section. Hyalobarrier is the only product – choice in hysteroscopic surgery. Hyalobarrier has proven efficacy through a large number of clinical trials; during the period 2000-2014 it was applied to over 100 000 patients, with no adverse effects being reported (infections, foreign body reactions). Hyalobarrier is a medical device, which can be purchased without prescription from any pharmacy, after an order to Novus, then the patients provide the surgeon with the gel before the operation. Hyalobarrier should be stored in a fridge. Before use the patient information should be read. Hyalobarrier is not reimbursed by the National Health Fund. Most gynaecological hospitals and practices work with Hyalobarrier. Hyalobarrier is applied in the abdominal cavity or the pelvis on the sutures as well as on areas that have been surgically treated. Due to its high adhesivity, it adheres firmly to the areas where it has been applied thus separating them physically and protecting them from adhesions during the risky 3-5 post-surgical days.